A detailed travel guide for Beijing that covers recommendations for restaurants, attractions, shopping and accommodation in Beijing. Leave what you have in your mind behind and get ready for a totally a different experience. Being in Beijing is like spring; making you feel hopeful, happy and peaceful. If you want to feel alive, come and visit Beijing for a real refreshment. Beijing is the city of cheerful and outgoing people. Dining out is the most popular social activity for all the age groups. Their biggest pleasure is eating and they are so open to new tastes. Getting ready for a culinary feast will be your advantage since you will be trying new tastes in Beijing. Even if the air pollution and traffic jam especially in morning hours can be regarded as the disadvantages of Beijing, Chinese people came up with a great solution. You can see people riding mopeds or bicycles as many as driving people. Being one of the most populous city in the world, Beijing is more attractive compared to them since it is populated with tolerant, kind and cheerful people. Weather in Beijing is under the effect of Monsoon climate and it is dry and cold in winters whereas the summers are humid and warm. With its significant architecture, favorable climate, nice people and heavenly cuisine, Beijing is growing impatient to show you what it has. Formerly known as Peking, Beijing is located in the northeastern part of China. Capital International Airport is one of the biggest airports in the world and situated 32 km northeast of the city center. There are many direct flights of the major airlines all over the world to Beijing. Check out the official website of Capital International Airport for the transportation options from airport to the city center. Being the longest defense wall in the world, Great Wall of China is one of the most important members of the UNESCO’s World Heritage List. One of the most fascinating tourists attraction point in Beijing, Forbidden City is an imperial palace located in the heart of the city. Consisting of religious buildings where dynasties visited for good harvest, Temple of Heaven is considered as one of the symbols of Beijing. 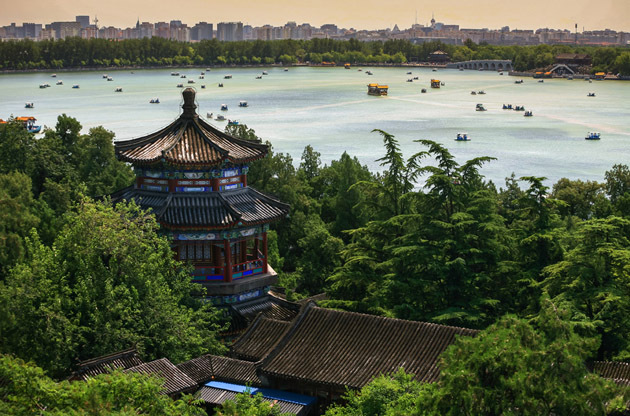 Served as an imperial palace, Summer Palace is now a park under the coverage of UNESCO World Heritage. It covers an area of nearly 3 km2, 2.25 of which is covered by water. Are you in the mood of a historic and artistic journey in Beijing? You may start your tour from these museums. Located in Tiananmen Square, The National Museum consists of two museums which are The Museum of Chinese Revolution and the Museum of Chinese Revolution. Being one of the biggest museum in China, The Palace Museum was established on the treasure collections of Ming and Qing dynasties. If you like to return to your country with bunches of memories and souvenirs, here are the most advantageous shopping centers which of all have a central location. Acrobats are really popular in Beijing and China overall. So it is a perfect idea spending one night watching these amazing shows. Chaoyang Theatre would be an ideal option. If you want to experience the real nightlife of Beijing, Houhai Lake Area is the first place that you should come. Being one of the Beijing’s top entertainment districts, Houhair Lake Area has so much to offer. Eating is something very special in China and you can taste many different (and may be experimental for you) dishes in Beijing. Sweet sauces, Peking roast duck, Shandong chicken or famous local side dishes like douzhi, aiwowo or miangao are worth tasting. Here are some of the best restaurants that you can go on a culinary tour. Being the most important city in China, Beijing is a shining star of the world in terms of production and export. Welcoming millions of people in a year for especially the fairs and exhibitions, Beijing boasts being the leader city in this sector. Its being one of the largest economy in the world and having the spectacular venues and fairgrounds with modern facilities, Beijing remains the number 1 city for international meetings like congresses, symposiums, conferences and tradeshows. Chinese girls are really social and helpful but some of them may be malevolent. Be careful when these girls just walk towards and invite you for a drink in case they may swindle you out of cash. Also bear in mind that counterfeit products are widespread in China. So be careful when buying a low-cost product since it may be illegal to enter your country with these according to your country’s regulations. If you think that the cab driver is inducing you, write down the cab number which is on the right corner of the windscreen. If you make the driver notice this, he will surrender since the penalty is really high. You will probably come out ahead if you haggle when shopping.